The M.V. Kennicott, a freight train, and an excellent cloud. I loved the hostel where I stayed in Seattle — called The American Hotel, no “s” — but last night sucked for sleep. The first night, I had a single room with an unexpected upgrade to a private bathroom with a bathtub. That was a gift beyond imagining. I got some sleep and woke up to a male pigeon trying with utmost sincerity to woo a girl bird on the awning below my window. The window had no screen — CAUTION — DO NOT SIT ON LEDGE — DO NOT LEAN OUT — so the first thing I did was stick my head out to say hi to the pigeons. I felt right at home. Last night, I had to move into a dorm. This is a busy summer weekend downtown, and the hostel filled up with Toronto Blue Jays fans — visiting for a game with the Mariners — and also lots of Girl Scouts. One of those groups totally ignored the NO ALCOHOL IN THE ROOMS rule and it got pretty rowdy on the fourth floor. I also had two roommates and the window was wide open. First there were the post-game fireworks two blocks away at Safeco Field and then there were these crazy loud seagulls. Who knew seagulls had so much to say all night long? Also, some guys yelling and then a few bottles thrown down in the street. The hostel is in a gritty neighborhood but, except for the sleeping part, I didn’t mind at all. I have resolved not to be a complainer on this trip. When I thought for a minute they were going to put me into a 6-person instead of 4-person dorm, I held my tongue. Even the drunk guy who rode by on a broken-down bicycle and hollered that he liked my boobies didn’t bother me. So when I say last night sucked for sleep, that’s really not a complaint. It’s just an observation. 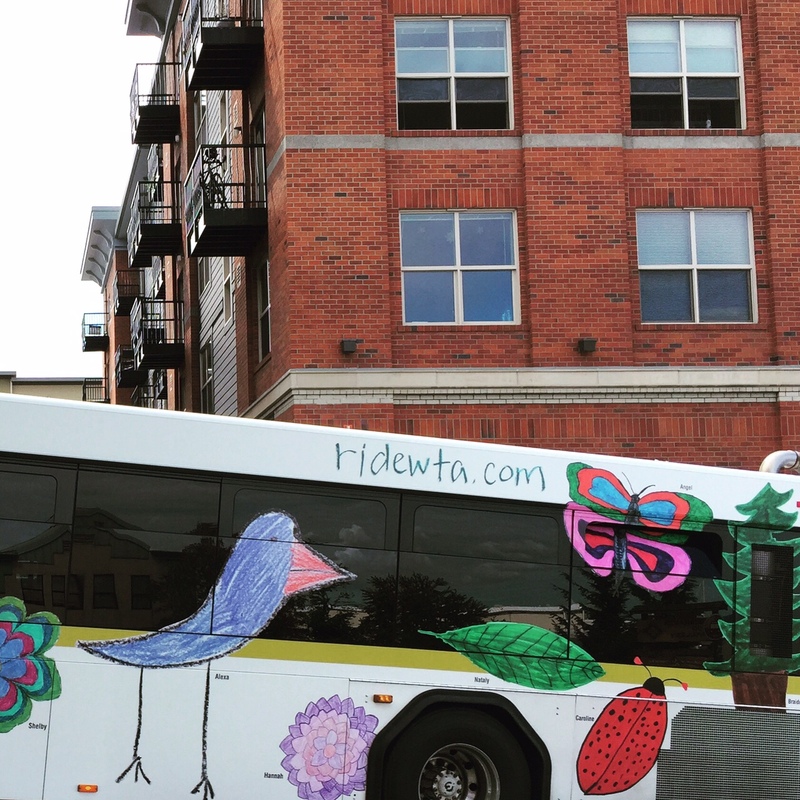 Bird and bugs on a bus in Bellingham, with bricks. Still, I was glad to get on the Amtrak Cascades train for Bellingham this morning. What a nice train that is! It’s a smooth ride along the water, and it rocks rather than rattles you. The attendant was cheerful and had a gorgeous French accent — you’d want to go wherever she’s taking you. I napped a little and when I woke up we were very close to the station here in easygoing Bellingham. (The train goes on to Vancouver, B.C.) I feel that I am mellowing out as I move north. I can’t know what’s next, but my life in this moment is astonishingly good. 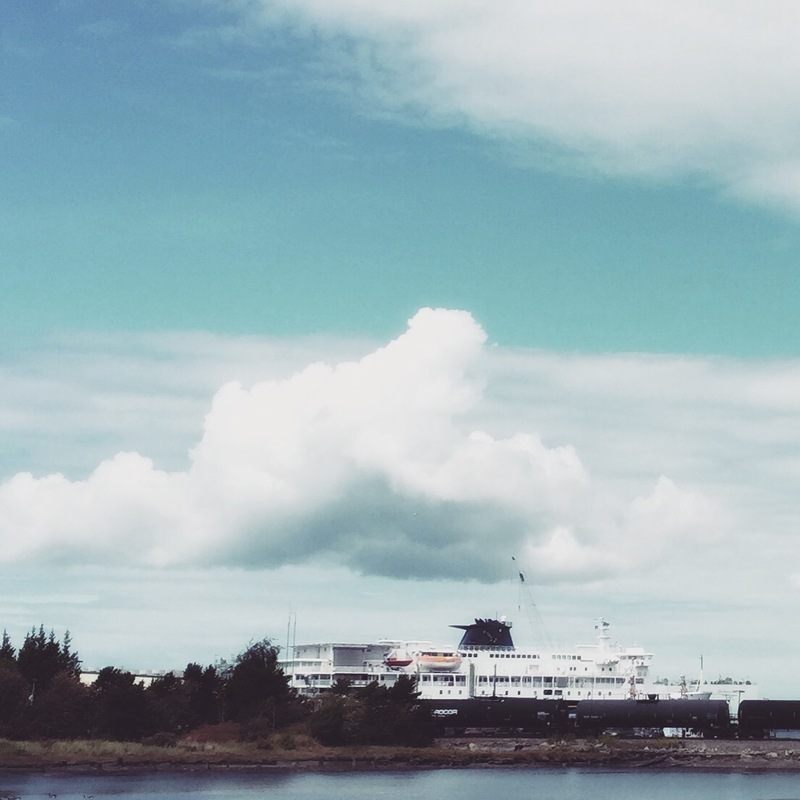 When I look over my shoulder here, I see nothing but the MV Kennicott, which is an even bigger boat than I expected. We board in about twenty minutes, and that’s where I’ll be until Thursday. Thanks so much for reading and for your responses. More notes to come! Shae, I love your writing. So fresh, clean. I’m right there with you. Boobies, pigeons, and tears…oh my! All of that and more. (Boobies is just fun to say. Maybe I should do it more often.) Thank you for your kind words, Laura. Yes, definitely. I’m loving it myself! A good word for us outliers. Consider the blue footed booby bird. The word covers two of your major bases..